Obsessive-compulsive disorder (OCD) is a chronic serious anxiety disorder affecting as many as 1.2% of the population worldwide. 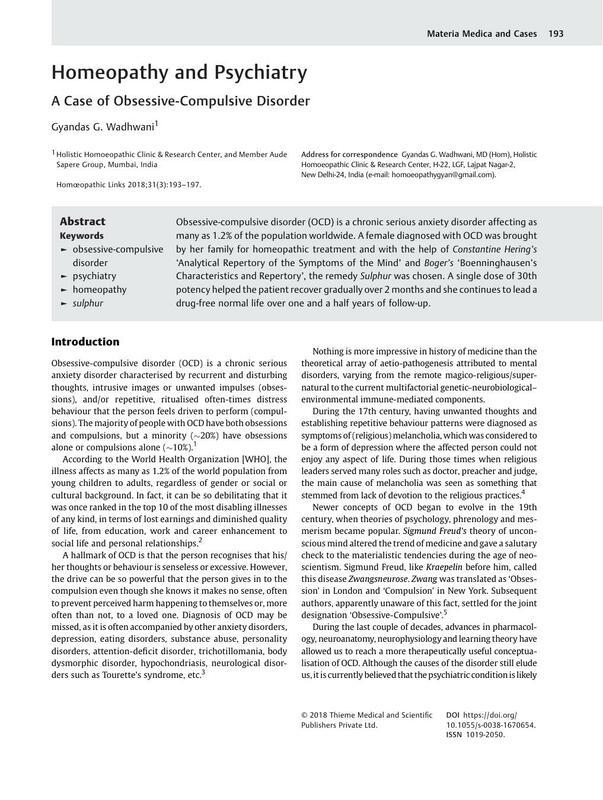 A female diagnosed with OCD was brought by her family for homeopathic treatment and with the help of Constantine Hering's ‘Analytical Repertory of the Symptoms of the Mind’ and Boger's ‘Boenninghausen's Characteristics and Repertory’, the remedy Sulphur was chosen. A single dose of 30th potency helped the patient recover gradually over 2 months and she continues to lead a drug-free normal life over one and a half years of follow-up.